Support is provided each day by the all-volunteer GCP&T Trail Sentinels, who patrol the trails to provide mechanical support, basic first-aid or request a cyclist to be picked up the GCP&T SAG Team for a ride back to the Xenia headquarters. Cyclists travel from all over the country to experience the all-paved and high quality five paved trails within Greene County and return to experience the family-friendly, camp-like atmosphere of the event. Submitted photos Good food and better company are part of GCP&T’s Greene Trails Cycling Classic as GCP&T Trail Sentinels Larry Rodney and David Harrison volunteer at the buffet table for the hungry cyclists. *$10/person discount with group rate — 5+ people from bicycle club with registration mailed together. XENIA — Local and visiting cyclists are invited to join the 2018 Greene Trails Cycling Classic (GTCC) presented by Greene County Parks & Trails (GCP&T) from Thursday, July 19 to Sunday, July 22 as it celebrates 15 years of cycling. GTCC cyclists can register for one to four days of cycling adventure showcasing the region’s 62 miles of paved, multi-use trails that is part of the nation’s largest network of trails. Online registration is available at www.gcparkstrails.com. “Our paved trails are renowned throughout the nation for their quality, safety and scenic locations. Cyclists come to Greene County from across the United States just to experience our five-trail system with four trails converging at Xenia Station. Trails translate into family memories as well as dollars and cents for the local economy,” said GCP&T Director Jon Dobney. The Classic will be based at GCP&T’s Fairgrounds Recreation Center. A different trail will be featured each day. “The event is designed to meet the needs of any cyclist whether they want to just come for the day, the weekend or all four days. Participants can choose to camp on-site, bring their travel trailer or stay in a local hotel or bed-and-breakfast. You really can design your own cycling adventure that fits you and your family’s needs,” said GCP&T Events Manager Robin Gregory. Prior to the official start of the cycling celebration, the event will kick off with a Twilight Trail Tour with the GCP&T Trail Sentinels beginning 6 p.m. Wednesday, July 18 at the Fairgrounds Recreation Center and traveling to Jamestown on the Xenia-Jamestown Connector Trail. Participants will enjoy a quick break in the village before heading back to headquarters. On Thursday, July 19, cyclists will travel the Creekside Trail from Xenia to Dayton. The day’s ride will also include the popular history ride with a rails-to-trails self-guided program along the trail. Other travel options in Dayton include visiting Wegerzyn Gardens with its unique display garden areas as well as the renowned urban 2nd Street Market managed by FiveRivers MetroParks. Upon their return, cyclists will enjoy dinner and ice cream provided by Young’s Jersey Dairy. On Friday, July 20, cyclists will begin their day with the event’s popular carbo-loading pancake breakfast and Century Ride. During the day’s ride, cyclists can visit unique shops and restaurants, as well as shop in the “Antiques Capital of the Midwest” in Waynesville. All purchases will be picked up and transported back to the event headquarters by the event’s Support-and-Gear (SAG) team. “Our GTCC Support-and Gear (SAG) Support will also be available for repairs, couriers for purchases or just bringing tired cyclists back home to headquarters,” Gregory said. Cyclists can eat at Greene County restaraunts Friday evening. The northern section of the Little Miami Scenic Trail will be featured Saturday, July 21, through the village of Yellow Springs and on into Springfield. An off-trail loop to Clifton Mill — the oldest water-powered grist mill in Ohio — is available for an additional ten miles. This ride will feature its first GTCC Poker Run. Players will stop at three locations along the trail to compete for the best hand. The final two cards will be drawn at headquarters with the winner announced during Saturday’s dinner. Prizes will be awarded; $5 per person donation is requested with a registration deadline of Friday, July 20. On Saturday evening, cyclists will enjoy a hot, fresh dinner buffet and receive their free Century Ride photo, as well as enjoy Century Ride Awards, GTCC Slide Show and Bingo with prizes. Cyclists can experience the Ohio-to-Erie Trail on Sunday, July 22, from Xenia to Cedarville and beyond to South Charleston and stop for lunch while cycling through eastern Greene County’s farmland. The ride will offer SAG support until 2 p.m.
All rides begin and end at the Fairgrounds Recreation Center and are supported by SAG daily for rider convenience and safety, as well as offering rest stops supplied with snacks and beverages. Routes include on-trail, out-and-back trips, as well as extended rides on rural routes on designated days. Additional amenities this year include on-site chair massage for a fee, free morning yoga class, on-site bike repair and pick-up of items purchased at local shops while riding on the trails. Greene Memorial Hospital will offer on-site first-aid services to cyclists during the four-day event. Registration includes Fairgrounds Recreation Center campsite, SAG, fully-supported rest stops, purchase pick-up, breakfast daily and all evening entertainment including meal on Thursday and Saturday night if registered for Thursday and Saturday. A brochure and registration form is available on the website at www.gcparkstrails.com, by calling 937-562-6440 or emailing info@gcparkstrails.com. Cyclists are urged to join the conversation on Facebook at Greene County Parks & Trails or on Twitter at GC Parks & Trails. https://www.fairborndailyherald.com/wp-content/uploads/sites/50/2018/07/web1_Bikers.jpgSupport is provided each day by the all-volunteer GCP&T Trail Sentinels, who patrol the trails to provide mechanical support, basic first-aid or request a cyclist to be picked up the GCP&T SAG Team for a ride back to the Xenia headquarters. 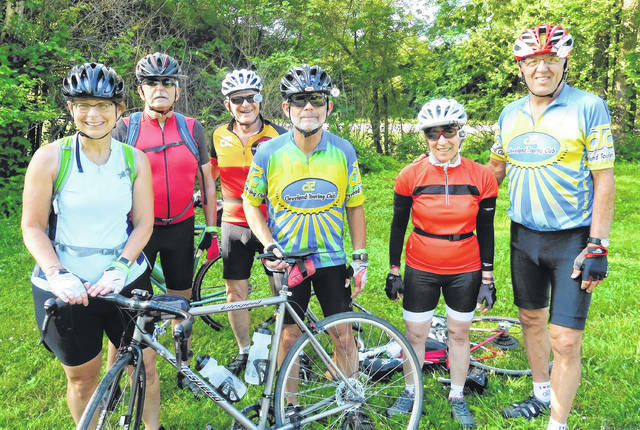 https://www.fairborndailyherald.com/wp-content/uploads/sites/50/2018/07/web1_Bikers2.jpgCyclists travel from all over the country to experience the all-paved and high quality five paved trails within Greene County and return to experience the family-friendly, camp-like atmosphere of the event. 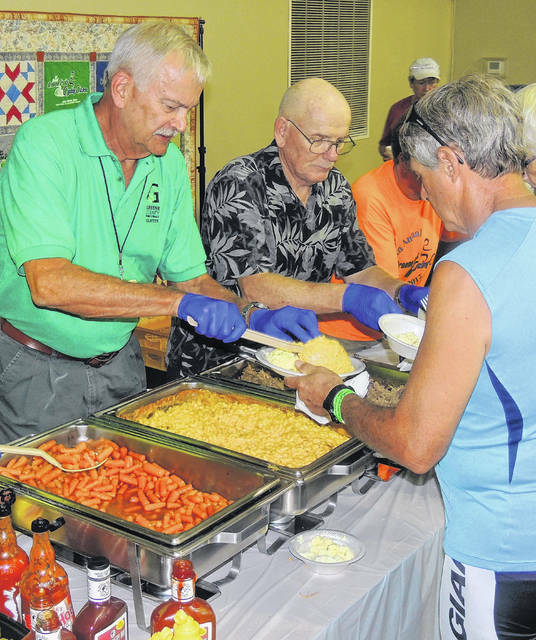 https://www.fairborndailyherald.com/wp-content/uploads/sites/50/2018/07/web1_Buffet.jpgSubmitted photos Good food and better company are part of GCP&T’s Greene Trails Cycling Classic as GCP&T Trail Sentinels Larry Rodney and David Harrison volunteer at the buffet table for the hungry cyclists.